I'm not sure I would take computer security advice from the Department of Homeland Security. But there are two good reasons to uninstall QuickTime for Windows. First, Apple has ended all support for it, including security patches. (QuickTime for Apple products is still supported.) Second, Trend Micro has discovered two unpatched critical vulnerabilities in QuickTime, and Apple is not going to fix them. Most recent comments on "[QUICK] Uninstall QuickTime for Windows"
Totally agree with your comment about Java. Unless you need to have it installed - and most people do not - the best option is to remove it. Not only does Quicktime remain available for download from the web page, but it is also still listed if you run Apple Software Update. WTF? Glad to get this warning. QT is history on my Win10. My Windows 7 PC has Quick Time 7, not QuickTime for Windows. Does your warning apply to Quick Time 7 also? Concerning Java: I require Java for a couple of programs I run on my Windows 10 laptop. People need to be aware that Java can be turned OFF for Internet use, where it is quite dangerous to use, while being perfectly safe to run locally on your PC when needed. When any video file fails to play in any player, it is always recommended to try VLC FREEware video player that technically no Windows system should be without. VLC has been known to render practically any video format that you can throw at it… including QuickTime formats (*.mov and *.qt). Some sites are reporting that if your internet browser (Firefox and/or IE) has a special plug-in for QuickTime, it should be disabled/uninstalled manually via your browser’s “Options” menu. BUSTED!!!! - Just YESTERDAY - I clicked on a link a friend sent me and it said I had to download the 'new release' - I have an OK firewall and good protection - so I started, and then hit hit me: the date of the release was the same date 17 April 2016!!! - quick STOP THE DOWNLOAD!!!! - OMG I CAN'T!!! UNPLUG THE COMPUTER - then spent the rest of the day doing what I normally do later on in the season - spring cleaning - scrubbing my hard drive clean with all antivirals back-to back, doing deep cleaning that I hate because of my limited knowledge but no crashes this year (have a backup just in case - thanks Bob!!!) and BOY HOWDY what a wake up THAT was! -- now my computer SCREAMS like it used to, and all it took was but 10 hours - and I had a very good book to keep me occupied. So, now -- a once MACNATIC - who quit with the Power Mac (slower than a slug on granite in a Minnesota February)- and finally broke down and bought a PC AND about double it's price in software - and have NEVER looked back since. (BTW, my Mac Plus STILL works!!!! Battery is shot so need to adjust for that, but dang! what a beauty THAT was - and still is actually TBT). Power Mac's Sunk me on Apple and I can't say I miss it at all, my Old Apple II still runs those old twin floppy's of WordStar II in one and a blank floppy in the other - and I can still remember how I LOVED keyboard short-cuts, no need for a mouse really. But the spell checker!!!! highlights the word, but you need a dictionary to look up the spelling!!!!!! -- but I wander THANKS AGAIN BOB!!!! AWAY GOES APPLE FROM MY LIFE FOR THE SECOND TIME!!!! And yeah, for me you were literally a day late so I got BUSTED!!!! And DANG! I KNEW better, but out of habit hit 'download' and it sure looked right until I saw the date and had to pull the plug. And I nearly finished the book! I needed the day off! Can we just disable QuickTime, and run it manually when needed for viewing or editing videos that are already on our computers? I found a QuickTime.mpp file that's an Adobe Reader plug-in . Does this warning apply to this plug-in as well? How would this be removed, please? On my external hard drive, I also found a QuickTime.qtp file as well as some QuickTimeInstaller.exe applications. Does this warning also apply to them? How would these be removed, please? EDITOR'S NOTE: You can delete those files manually if desired, but uninstalling QT should take care of the problem. Under my programs list (not easy to find with Windows 10) I have Quick Time 7, Apple Inc. I do use ITunes to sync my little shuffle so I can listen to books but other than that, is there a way to tell if any of my other programs are one of those obscure programs that might use it? Thanks for the warning, Bob. I have used QuickTime only because video created with my Kodak camera required it. I will have to explore other ways to play those files. Whew - That was a close one, for me! I did have it on my Computer, but, about a month ago - I reinstalled Windows 10 and many of the things I have been removed, Quick Time was one of them. Yes, Bob - I finally took the plunge and have gone with Win 10. My daughter decided she wanted Windows 10 after I had updated, cleared out all unnecessary junk and older programs she wasn't using anyway. I finally saw the ease of installing Win10, that I hadn't seen before. Plus, it really seemed more like a Windows Operating System. I found many similarities, which didn't seem to be there before. Of course, I installed both Win 10 before the Nov. Update. Java is required by the US government for some of its websites such as the US Patent and Trademark Office for those who file patents electronically. Is it dangerous to use, even though it is being regularly updated by Oracle? EDITOR'S NOTE: It's hard to say, because you might have the latest, patched version of Java, and still be vulnerable to a bug that hasn't been discovered, reported, or fixed. If you MUST use Java, limit it to one browser that you use only for that purpose. Turn it off in the browser you have for daily use. 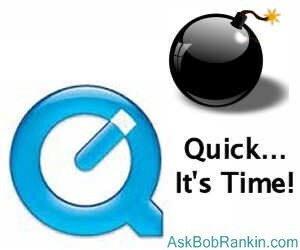 So, it's time for quicklime on your QuickTime. After uninstalling QuickTime for Windows, you'll no longer be able to view/edit .mov files from within Picasa 3 (which is also legacy software now). Guess that will speedup our switch to another pix/vids organizer/editor. Meh. EDITOR'S NOTE: QT-Lite was discontinued in 2010. So chances are, it's best to avoid it as well. What do if your smart daughter convinced you to buy a MacBook - it says you can't uninstall b/c it's needed for their OS X - but they won't support it or provide security patch ? Any thoughts ?? EDITOR'S NOTE: As mentioned in the article, QuickTime for Apple products is still supported. Unfortunately, I cannot remove QuickTime. I'm a radio disk jockey whose noncommercial program is nationally distributed by the Public Radio Exchange (PRX). PRX's distribution system REQUIRES QuickTime in order for the network to distribute programs to its member stations. The system cannot function without it. I've alerted PRX to QuickTime's vulnerability two months ago, but to date, I've received no response. Although PRX is inthe process of redesigning its website, I have no idea if the network is replacing QuickTime as part of its revamp. So I'm stuck.